So, if you don’t know about how the Creators are doing a series of posts about what their favorite islands are by now…well, let’s just say you need to get with the program. So far we have Captain Crawfish with Red Dragon Island, Director D. with Cryptids Island and Legendary Swords, and Dr. Hare with Skullduggery Island. I’m just waiting for someone to say Ghost Story Island…and, unfortunately, that beautiful day won’t be today. First off, Comic Kid’s pick. Or should I say picks. We’re sharing the Poptropica creators’ picks for their favorite Islands. Today: Comic Kid. I really loved the spooky yet fun feel to this island. I love Eastern Europe so designing the village and parts of the castle was quite a treat for me and I had fun all the while. Plus, who doesn’t want to be a bat and fly around? Talk about awesome! Another genre I appreciate a lot is that of the cowboy and the Wild West. The building designs for this island were really fun to create and see developed. I really liked the sunset setting for Dusty Gulch, the island’s Main Street. In fact, I love all the towns for this island! I don’t know…I liked Wild West Island okay but it wasn’t my favorite. And Vampire’s Curse just seemed a little short to me. But that might be just me. Next up, Shark Boy’s breaking the record of how many things are your favorites with three things. Guess he had a hard time choosing. We’re sharing the Poptropica creators’ picks for their favorite Islands. Today: Shark Boy. 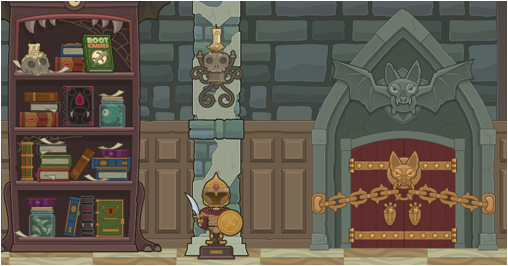 I love mythology and really enjoyed seeing many mythological characters come to life with a fun Poptropica twist. This was the first Island I helped write the story for, and where Shark Boy was born. Although not a full island, this mini-quest is a personal favorite. I was able to write the story for this one, and even though it was a short quest, we were able to pack in a bunch of fun and interesting interactive elements. So, Mythology Island. I liked it. But I wouldn’t include it in my list of favorites. Shark Tooth Island’s okay. I can see why Shark Boy would like it, though. I mean, ya have to love the island that your little avatar/character thing is from. And the Haunted House quest thing. I don’t know, I haven’t played that in a long time. So I don’t know what I think about that one. The Creators, for some reason that’s beyond me, decided that it was necessary to make a guide that you can download when there are perfectly good places (and I’m not ashamed to say that this is one of them) that you can get good guides much easier and without having to download a bunch of stuff, and yeah. You can probably tell that I don’t like it. Vampire’s Curse walkthrough app now available for free! Good news! 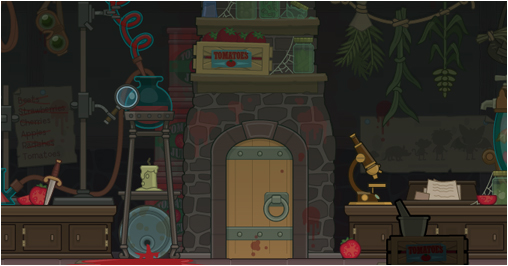 Now, when you download the Poptropica Tips and Tricks app for your iOS or Android device, you can get the new Vampire’s Curse Island walkthrough absolutely FREE! Whether or not you’ve already downloaded the app, you can nab the updated version from the iTunes App Store or the Android Market. Then, visit the “Island Guides” menu and start your free download of the Vampire’s Curse Island walkthrough! 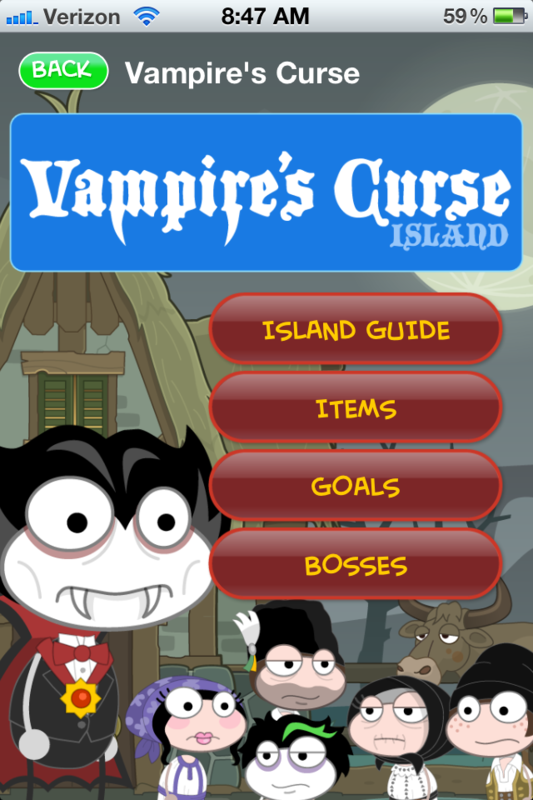 Just one question: why would you need a guide to Vampire’s Curse Island on your mobile device? It’s impossible to play Poptropica on your mobile device. Icy Comet’s Blog now has a guide to Vampire’s Curse Island! The guide was done by me, Icy Comet. You can see the guide by clicking HERE. You can also see a lot of other great guides by either going to the Guides page or the Video Guides page. I hope the guide helps! It’s Finally Here… The Curse! Nonmembers, rejoice! Spring is here, and with it, comes the release of Vampire’s Curse!You can sink your teeth into Spring, by saving Katya, and turning into a tomato headed fanged creature. It’s okay though, it’ll pass. Don’t forget: Vampire’s Curse Island is open to all tomorrow! The wait for non-Members is almost over. Vampire’s Curse Island will be available to everybody tomorrow. We’ll announce it the moment it happens right here in the Poptropica creators’ blog, so be sure to check in! Wait, was that post completely nessecarry? Well, no probably not, but still, I felt the need to post it to spam up this blog. The Creators have two talents. One, making an…okay (all right, better than okay) game like Poptropica. Two, making really random posts. When it comes to making posts that are random, already tell us about something we know about, and are probably just put up there to make it seem like the Creators are more active than they really are, nobody beats the Creators. Except maybe me, of course. Only a few days left until Vampire’s Curse Island is open to all! The headline sort of says it all, doesn’t it? Vampire’s Curse Island will be available to everyone this Thursday! At last, non-Members will be able to explore the shadowy corners of Count Bram’s castle, and seek to end the curse of vampirism. But don’t forget: the Members-only Vampire Count costume is only available until this Thursday! Always have to remind you that there’s such a thing as Membership, don’t they. One, more thing before I leave. I would just like to say that the Creators still haven’t fixed that glitch thingy that Brave Tomato pointed out to me. The glitch thingy is, when you go to the Island Tour place and you scroll down that list of islands that they have there, the symbol for Time Tangled Island is the same as the symbol for Twisted Thicket Island. Well, on that random note, I think I’ll leave you now. Members, I don’t envy you that much right now. The items from the Members-only gear pack aren’t the most…attractive…of items. Though to use something that Black Widow wrote in her post, the items will help you create a “stink-tacular” look. 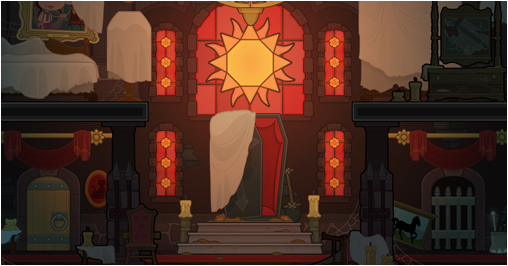 Vampire’s Curse Island is coming soon, and the fun has already started for Poptropica Members! 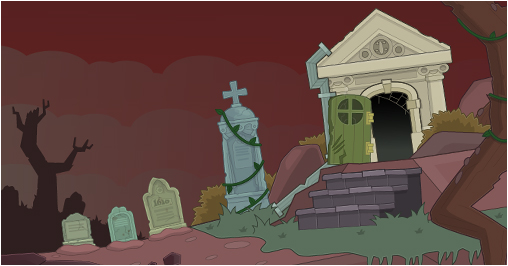 The Vampire’s Curse Island gear pack is available now in the Poptropica Store! Pick up the stink-tacular Garlic Breath power, chew on a stick of Vampire Bat Gum, or dress up as the most stylish Vampire Count or Countess around. 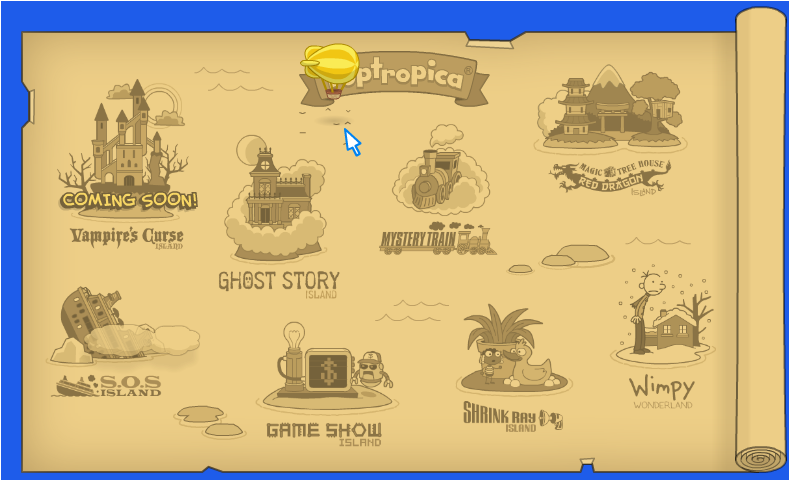 Picking up your Member gear pack is easy: just visit Poptropica and click on the green coin icon to access the Store. The items are right there. If you’re not a Member, find out how to get Membership. And fangs for playing! The countdown for Vampire’s Curse Island has begun! Members, prepare yourselves to camp out by your computers to try to be one of the first ten to finish the island! Also, there’s a new map for when you travel from one island to another. Personally, I liked the old map better. Gosh, Creators, you have to change something when it is already perfect! Anyway, Cactus Von Thorny Garlic is a character that you will probably see in Vampire’s Curse Island. And why does he have that metal band around his neck? Rumor has it that Garlic Von Thorny Cactus is a vampire hunter. That rumor is probably true, because Garlic Cactus Von Thorny has a garlic on his hat (which vampires are said to hate), a bow and arrow, and the thing around his neck might be silver (which vampires also hate…or maybe that’s werewolves…). Obviously, that rumor was started by someone who is much smarter than me and actually takes time to think about these things, because I would never have thought of that. More news about Vampire’s Curse Island and Garlic Thorny Von Cactus hopefully coming soon!